For a list of online vendors please see below. Alternatively you can order direct from Ravensforge Books in either print or eBook format. 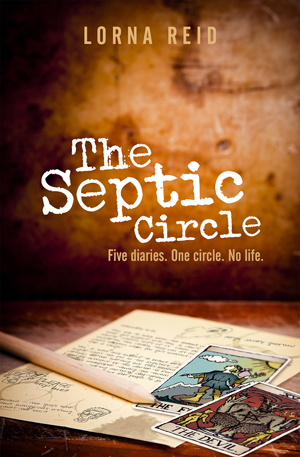 The Septic Circle is a humorous diary-style book, with the story constructed from the diaries of five members of a ‘not-very-psychic’ circle, with each person’s twist helping to build up a humorous (or poignant) picture of events. As the only sceptic in Cravenly’s new and not-very-psychic circle, how many haunted toasters, possessed worry dolls, and sabotaged book signings can one man cope with? Jay Taylor’s patience may already be stretched to breaking point, but the odious presence of ego-ridden psychic star, Fenwick Arcana could just push him over the edge. Having taken the nervous wreck who started this whole mess, Freddy, under his wing, and with gossip-monger Lysander and irrepressible believer Marnie to cope with, the circle’s most reluctant member is about to have his sanity severely tested. Gathered together, their diaries chronicle the circle’s first year, as they fight through a minefield of paranormal detritus, smug wizardry, toxic baking, revenge plots, and the filming of disastrously amateur paranormal TV show, Spirit Squad. But through all that, perhaps the greatest battle any of them will face is one another. And the loneliness. For anyone who ever wondered if it is possible to catch a ghost using marmalade*.